The Science Service Historical Images website launched in 1998 to provide access to one part of this unique collection of science and technology photographs. The site contained over 2,000 captioned images pertaining to a wide range of electrical technologies. Those images were reunited with the larger body of Science Service images in 2017 and the website was retired the following year. In the 1980s, the collection of Science Service images was disbursed to various units within the museum based on subject matter. Those subjects dealing with electrical technologies came to the museum’s Electricity Collections whose staff and volunteers scanned images, transcribed captions, and built this website. The website presented over 40 years of electrical history covering large topics like radio as well as narrow topics such as image converter tubes. For access to these images, you may contact the staff of the Smithsonian Institution Archives. 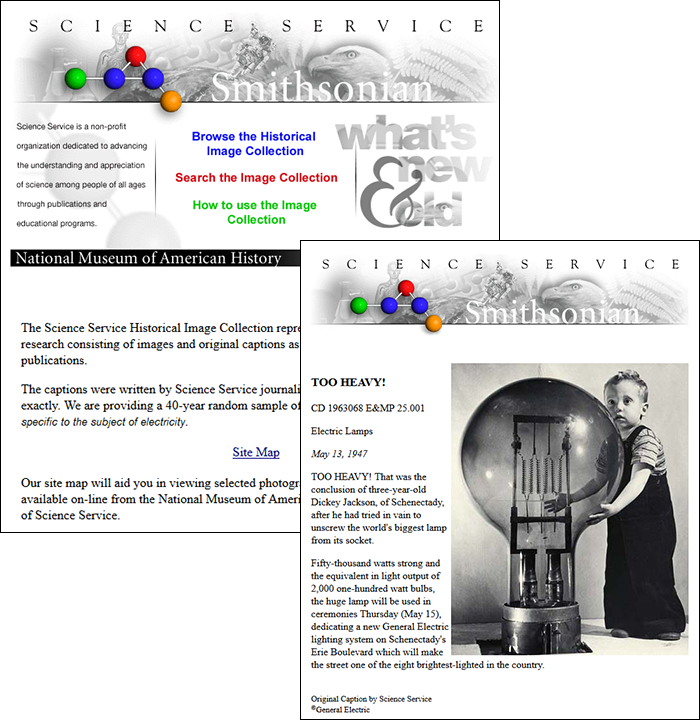 The former website is preserved on the Internet Archive (search for http://scienceservice.si.edu in the Wayback Machine).